YouTube vloggers are increasingly seeing the power of affiliate marketing. Become a member of our Uber or Munchery CPA Program to make great money with your popular social media and more. Members get paid for activations. So every time someone uses your promo code, you get paid. Lifestyle influencers cover a wide range of the Internet influencers that find success. But pretty much all influencers who allow their audience a peek into their life is a Lifestyle influencer. These vloggers casually mention brands and products that they use or want to promote and their audience responds in a big way! The PromoAffiliates roster of amazing companies now includes the Munchery CPA program. Of all of our brands, you will definitely want to consider promoting Munchery. If you have an engaging following on social media or represent influencers, contact Aaron@promoaffiliates.com at PromoAffiliates headquarters. We partner with popular bloggers. The Munchery CPA program is just one of the programs we have. The feedback proves that Munchery reviews are good. People are searching for promo codes in really high numbers and sites that rank high on Google search results get more promo code activations. I’m going to focus on lifestyle influencers as some of our ideal partnerships. What is our Munchery CPA Program? CPA typically means cost per action. In our Munchery CPA program, we pay our affiliates for every new person that uses their unique promo code. So for example, our top influencers make content for their platforms to give their audience an opportunity to try apps for free or discount. With a Munchery promo code, lifestyle influencers allow people to get their first delivery free. Every time someone uses the promo code this is called an activation. All of the activations for every brand are tallied and we pay out the second week of every month. It’s a pretty simple program and we have a lot of success stories! If you’ve been around tech and using apps for a while then you know about referral codes. There is a big difference between referral and affiliate promo codes. Payment comes when someone uses your code. So with referral programs, it usually just means that you get credit. For example, if you are someone who uses Uber, then you have a promo code or a link that you can share with friends and family. If someone uses your rider referral code, you get credit for your Uber account. Sometimes these credits expire or are able to roll over or whatever. Your activations are also tracked. I know it’s something that I may not need to explain over and over but we have questions on this all the time. Influencers tell us that they don’t make content for credit. So I just want to spell it out as clear as possible. We are a collection of tech nerds, writers, content creators, etc based in Hollywoodland in Los Angeles, CA. Nerds have been cool for a long time but writers are always cool! The best content creators are really context enforcers. Content has to be contextual and relevant to the times and the audiences that are using the content. I have been with the company for over two years and have seen so much growth and success. We have an epic history promoting Uber and have brought the company 500,000 new users! PromoAffiliates is pretty good at pumping people up. We believe that changing your paradigm and your perspective will make you free. Understanding freedom completely means analyzing your purpose. Our purpose as a digital marketing agency is to provide our clients with the exposure they need. Customer acquisition is a pretty simple thing if you apply the right tactics. That’s how we plan to find success with this Munchery CPA program. It’s going to be easy since the Munchery reviews are not bad! The digital landscape is wide open and ready for your success. True freedom means making a life and having complete faith in your passions. In this post I plan to re-educate you a little bit on what it means to be free. We think that we’re free but independence isn’t as powerful as interdependence. The truth is is that we need each other. The power of community may never truly be felt because we live in a society that is so dog eat dog. We gotta take care of number 1 right? Everyone is only trying to protect for themselves. The interesting thing about the Munchery CPA program and others is that it’s based on people. You’re the influencer who is powered by affiliate marketing. The data will show that affiliate marketing is only as good as the activations that are coming in. Companies love it because they pay us after the new customers have tried their services. We love it because people are paid for their work and their efforts. If you are a YouTube influencer making great content, people will respond. The Munchery CPA program is just one of many that we facilitate for you. Relevancy is key! There are so many benefits to food delivery services like Munchery. The Munchery reviews are consistently high. As part of the Munchery CPA program, it will be helpful that you mention some of these benefits. I’m going to go over a few basic ones here, but you will find which ones you like the best. On this note, I always suggest to our affiliates that they try the service themselves. Once you try Munchery and some of our other brands, you will excel in the promotion of those brands. You can use screenshots or videos of you actually ordering. Another idea is to order the meal cooking kits and have an unboxing. Viewers love to be part of your journey. Any unboxings allow viewers to be a part of the excitement. Differing from restaurant delivery apps, Munchery works with local chefs to make delicious meals available at a great cost. They also prepare boxes called shipping kits that allows customers to be the chef. The kits come with portioned out vegetables that just need chopping and maybe sautéing. What’s great is that the recipe in the box is complete for you and the sauces are already made. Some people don’t have time to shop and prepare meals. These are the people that also benefit most from meals that just need to be heated up. You hear about these meals on the Munchery reviews. The Munchery app has a great menu that changes daily. People are pretty overwhelmed by restaurant delivery apps because there’s so many options. Options are great but to be honest customers nowadays like to be told what to buy. As the Munchery menu changes daily with only a few options it feels as though there’s a big selection. Being a member and affiliate with our Munchery CPA program, you will need to know what type of customers your advertising too. Obviously if you have a certain demographic that follows you online, you will only be speaking to them. But most likely, there are a few different types of followers on your platforms. In general, millennials Love the on-demand culture. Getting whatever you want delivered, when you want it, and brought to wherever you are is pretty freakin great. Other sectors and age groups are catching on quick. Even baby boomers use on demand apps and services. They really do cross all age groups because the services are for most adults. It wouldn’t make much sense to have an app just for young people. Choi is right on this point. There have actually been laws put out in Los Angeles where no more traditionally fast food places are allowed. Areas in South Los Angeles especially have few grocery stores and no restaurants other that fast food. What makes our App and Munchery CPA programs so great is that these apps are making a difference. Munchery chef inspired meals are $7.99 delivered. After you sign up to work with us, you will be creating content to promote Munchery. If you have YouTube popularity, you will make videos that feature the code. You have a lot of freedom to make the kind of video that you want. We can help with production if you are in Los Angeles. We have a lot of production experience and you can see some of our videos here. Most likely, it will best to promote your code on multiple social media platforms. I’m going to detail below but you don’t post the same things on all social media accounts. Snap is more intimate while Instagram is kind of like a resume that you don’t just post anything. Obviously Facebook is losing showing a lack in usage. Also, if you have a big email list, we can send out an email about the promotions. All of this should be relevant to the content that you already put out on the internet. One way that you might want to interact with some of our clients is with their social media. Stick with what you know! You can get to know more about our brands by checking out their social media. Munchery is a great example of this because of their activity on Twitter.Content inspired by news is great for our Munchery CPA program. Munchery just tweeted about a 5% discount for recurring orders. So even though the menu changes frequently, you can order the same thing sometimes. Another recent tweet was announcing lobster here in the Los Angeles menu. With a great picture, Munchery is already making great content. If you are popular enough, you could just retweet or share content from the client directly sometimes. Sharing the brands own content and adding your own sentence with your promo code. It’s been mentioned a lot in here, but all the Munchery reviews are good! A few years ago, Geekwire.com gave Munchery and 9.3 out of 10. Taylor Soper, a contributor for Geekwire.com, tested 7 meal delivery services to get a sense of what options were out there for the person who is too busy or too lazy to get out and pick up their own food. Munchery reviews came in at the highest out of the group. So the experiment focused on two categories. First was the delivery process which was about how easy it was to order the meal and also customer service. Second was also the quality of the food. With Munchery, they partner with chefs so they do control the food. 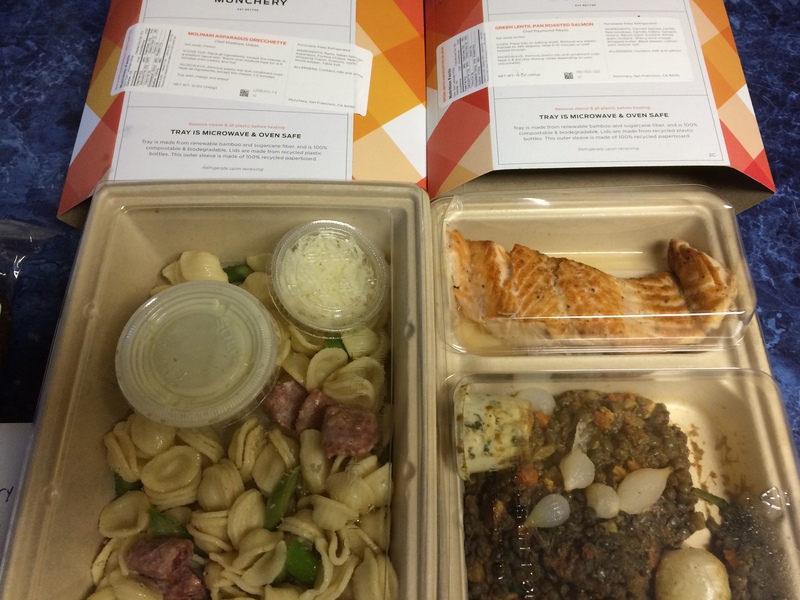 In this report, Soper gave Munchery a 4.8/5 for the food rating and 4.5/5 for the delivery service rating. Even with being a little disappointed in the soup that came with the meal, they were extremely impressed with the rest of the meal. They were testing the service in Seattle where Chef Bo Maisano was featured at the time. Aside from restaurant delivery apps there’s the services that let users do some of the cooking themselves. Mostly dominated by Blue Apron, Munchery is coming up in the ranks. Munchery delivers boxed meals that just need to be heated up. The company’s ready-to-cook meal kits really spiced things up. I’ve mentioned these kits a lot in this post. So awhile back, Munchery gave Business Insider a peak into these meal kits just before releasing them as an option to users. Use press to your advantage. In the Munchery CPA Program, you are promoting the app so see what others have said about it. See the next section for exactly what the cooking kits have inside them. A contributor to BusinessInsider.com, Biz Carson, was shocked at the quality meal that the kits allows users to prepare in only 15 minutes. One secret is that the kits already have sauces prepared which is where most of the recipes flavor lies. Carson was also impressed by the schedule that came with the kits. She was also into the small touches like the box of toothpicks that was included. The veggies were pre-sliced and the rice was pre-cooked. The meat in her meal was fresh and took the bulk of her cooking time. Even oil for the pan was included! After the meat was done, she added the veggies to be cooked. When it was all done, Carson had only used a bowl to warm the rice, a skillet and spatula, and a paper plate to spice the meat. A lot let dishes than if she had chopped the veggies herself and cooked the rice. Lastly, dessert was part of her meal kit. It was a simple recipe that only took some simple prep. It was a chocolate fondant which is like fruit compote on a cookie with sliced almonds. After prepping the fruit and sauce, it was just a quick 3 seconds in the microwave. I think that the point of Carson’s article is that, Munchery empowers you to be a part of your meal. With recent reductions in staff people are wondering what the future holds for the company that raised $85 million not long ago. Chief executive officer James Beriker was quoted in Eater.com as saying that the company’s small reduction (30 employees) was “a normal course adjustment.” He went on to say that Munchery’s business grew 60% in 2016 compared to 2015. There’s something to be said about tricking people into cooking their own meal. Plus there’s a lot of problems when just delivering for restaurants. Food can be the wrong order, it can be cold, it can have bad presentation, or even be delivered very late. So Beriker says that Munchery is poised with the ability to delivery ready-to-eat meals to about one-third of the United States population. This is a lot of people! Munchery gets ingredients on a national and local level. Bloomberg, Munchery prepared more that 643,000 meals that were not sold between September 2014 and July 2016. This waste cost Munchery $5 million a month as is not good for business. Tri Tran, Munchery’s co-founder grew up in Vietnam. His story of moving to the United States when he was 11 and also pursuing the American dream is part of what helped Munchery reach the heights it has. Last year the company had a valuation between $250-$275 million. The company was losing money with some aggressive marketing campaigns. With our Munchery CPA program, the company only pays out when new customers have ordered their first delivery. So the Munchery brand was awarded so much money by investors because venture capitalists have been looking for a service that can also make and delivery food profitably. The reports talks about how Munchery is also having a hard time keeping customers. This makes sense seeing as how it’s easy to lure someone in with free delivery and also promo codes. The hard part is to have customers coming back over and over. Thank you for checking out this Munchery CPA program article. I hope that it was informative enough that you also choose to work with PromoAffiliates. Contact aaron@promoaffiliates to get your unique promo code. You will promote this promo code on your social media in the manner that you wish as long as it is within the guidelines outlined by Aaron. We have a long history promoting services with promo codes and you can make great money with our programs. Our support staff will also help with content ideas if need be. Whether it’s Uber or Postmates or Munchery, it’s all about getting people to try the services once. After that, it’s up to the company to keep the customer. This entry was posted in Marketing News, PromoAffiliates News and tagged munchery delivery, munchery meal, munchery promo code, PromoAffiliates, seanturtle. Bookmark the permalink.